The reel “The Bonnie Isle O’ Whalsay” has sundry variations. This is (arguably) a Shetland reel, as Whalsay is a small island in the Shetlands. Of course, a tune and its name can have very different origins, so tune names alone are a poor basis for determining tune ontogeny. However, this tune does also have a certain Shetlandishness about it, so I’ll just go by that. If you compare this one to, say, “Far From Home” and “Da Rood ta Houll,” you’ll see that they, like most reels, are thirty-two bars. However, this is a “half-tune,” just 16 bars. Half-tunes are for short dances. The most common sixteen bar terpsichorean tune is the Fling or Highland Fling (also called a “highland schottische”), written in 4/4, with a tempo slower than reels, and played with a distinctive swing. In a fling the first note of each main phrase is emphasized, while the last three are all shorter though still played evenly, producing a rocking rhythm suitable for dancing quadrilles, or 2-, 3-, or 4-hand dances. It has been said that many flings when “adjusted” (i.e., doubled, straightened out, and sped up) can “make fine reels.” It is also said that some flings can be fairly easily turned into hornpipes, strathspey’s, single reels, or even jigs. As a result, playing a fling as a fling is a rare thing. A Schottische (pronounced ShoT-ish) is a distinct variation of the fling, and often just called a Barndance (because loads of people don’t know how to pronounce “Schottische”). In tune books or on recordings there can be confusion between the single jig, the barndance, and the fling – for instance on “Tunes of the Munster Pipers” most of what are called “Reels” are single reels, and some are actually played as flings (such as “Pat Wards”), while others are played as barndances. Some people argue that playing a fling doubled (i.e., 32 bars) is the traditional way. This is a confusion arising from the tune/dance separation, a punctuated uniformitarian tendency and, I’d argue, hyper-argumentativeness. In our sessions here in KC we play “Far from Home > Da Rodd to Hull > Bonnie Isle O’Whalsay.” In many Shetland sessions the last is played in a set of five: “Jack Broke da Prison Door,” “Donald Blue,” “Sleep Soond i’ da Moarnin’,” “Lasses, Trust in Providence,” and “Da Bonnie Isle O’ Whalsay.” Together these are sometimes just called “the five reels,” or “the Auld Five.” This set is on the album Da Silver Bow (1976), with Tom Anderson, Aly Bain, Trevor Hunter, and Davie Tulloch. Aly Bain (b. 1946) is from Lerwick, Shetland, Scotland. A founding member of Boys of the Lough, who learned fiddle from the master, Tom Anderson. 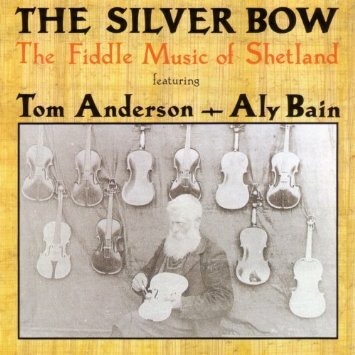 Aly Bain is himself a celebrated master of Shetland terpsichorean tunes. The A part of this tune is in A, and the B part in Amix. It is sometimes played AAB (24 bars). Arguably, playing it ABAB is better. It really depends on the dance. This article was posted in ABC format, Dots, MP3, Reel, Slow Session, Tune, Tune Comment and tagged ABC format, Irish Reels, Irish Traditional Music, Learning Irish Music, Recordings of Irish Music, Session Tunes, Shetland, Teaching Irish Music, Tune History. Bookmark the permalink. Follow comments with the RSS feed for this post.Post a Comment or leave a trackback: Trackback URL.